Ateliers Louis Moinet is a fully-independent firm established to honour de memory of Louis Moinet (1768-1853): master watchmaker, inventor of the chronograph in 1816 (certified by Guinness World Records™) and author of the Traité d’Horlogerie (1848). Today, Louis Moinet is perpetuating this legacy. The firm’s timepieces, produced in limited editions only, have won some of the most coveted honours (i.e Red Dot Design awards). The brand’s core values are creativity, exclusivity, art and design. ULTRAVOX is Louis Moinet's first ever Hour-Strike. It is an exclusive creation, designed to celebrate the 250th anniversary of Louis Moinet's birth. Its strike mechanism denotes each passing hour on the hour, marking out the appropriate number of chimes. MOGADOR is rare and refined, the orchestration of a world of beauty. Its dial boasts avant-garde colours, illuminated by its concentric Clous de Paris pattern, and framed by Moinet’s slim and graceful hour markers. TEMPOGRAPH CHROME features a new case and includes two major firsts. It features a completely black or blue surround. This extends from the bridges that structure the movement to the flange, itself engraved with a concentric Clou de Paris pattern. MARS is a unique creation that enshrines an extraordinary spaceborne adventure. 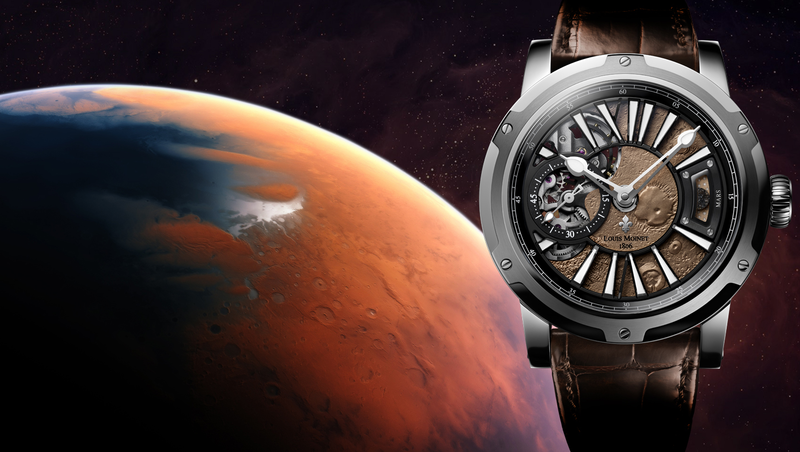 It features a genuine Mars meteorite fragment in a capsule at 3 o'clock, amid a dial that faithfully reproduces the surface of Mars, complete with its legendary volcanoes. Louis Moinet feel that the 150th anniversary of Around the Moon by Jules Verne deserves to be celebrated befitingly. At three o'clock, MOON features a capsule containing a genuine lunar meteorite fragment. Louis Moinet has redeveloped practically every decorative item, with a new case, new hands, a new dial, and more. For the first time, Memoris is now available with a contemporary 46-millimetre titanium case, making it very light on the wrist.